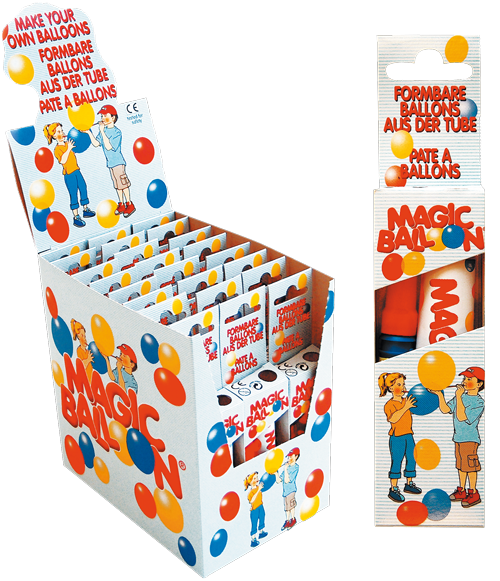 CREATIVE BALLOON MODELING – EXTREME ENTERTAINMENT WITH MAGIC BALLOON PASTE. Use moistened fingers to place a dime-sized blob of paste on the blow pipe so that it represents a fat matchstick head. Ensure that there is an airtight seal between the paste and blowpipe. Inflate the balloon, blowing carefully at first, then more vigorously to inflate it completely. Simply pinch the balloon together to seal any holes. Pinch the balloon walls together near the end of the blow pipe then pull away from the pipe to seal and remove the balloon. Interesting balloon shapes can be created by pulling on the balloon during inflation. Rubbing the balloon with fabric or the back of your hand can create static electricity, allowing it to stick to other objects. Freshly inflated balloons adhere to other balloons, allowing you to easily create animals and other fun shapes. Squeezing a portion of the MAGIC BALLOON paste out of its tube and sticking it on the end of the blow pipe, modelling a gigantic Q-tip. Blow carefully until a bubble forms, then blow vigorously to inflate the balloon until only a small portion of the paste is left clinging to the pipe. Then twist and pinch the balloon shut as you pull it off of the pipe. The more paste that is used, the larger the balloon can get! Simply pinch the balloon together to seal any holes that might form. 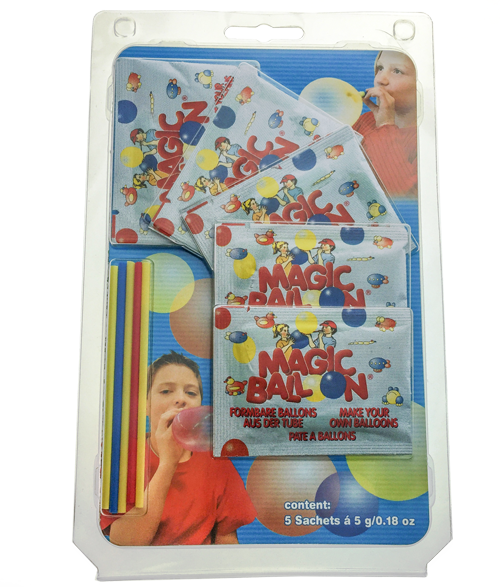 MAGIC BALLONS are available in blue, yellow, and red. Colors can also be mixed to create colorful marbled balloons. Create elongate and elaborate shapes by pulling on the balloons during inflation. Creative, fun, figures and creatures can be created by molding and connecting balloons of various shapes. Who can blow the biggest balloon? Who has the most dazzling colors? Who can inflate one balloon inside of another? Who can create the best bear, duck, snake, or other animal? The possibilities are endless! The integrated check valve prevents air from escaping allowing for inflation in small stages. This valve also hinders the inhalation of vapors. 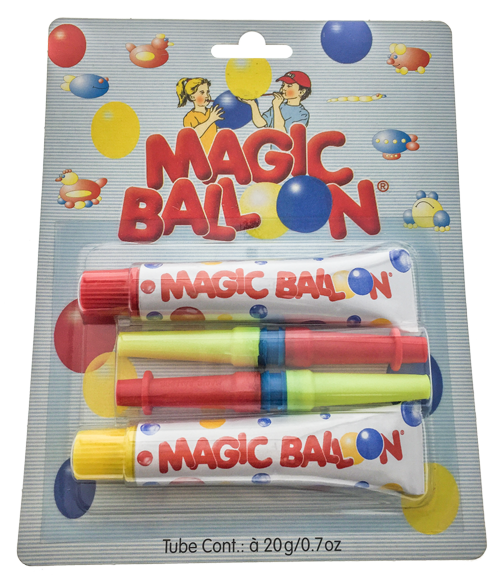 The use of MAGIC BALLOONs increases oral and respiratory coordination and can be used to catalyze progress in logopedic therapies. The use of the blowpipe increases lip and tongue coordination while controlled exhalation aides breathing techniques and other respiratory processes. 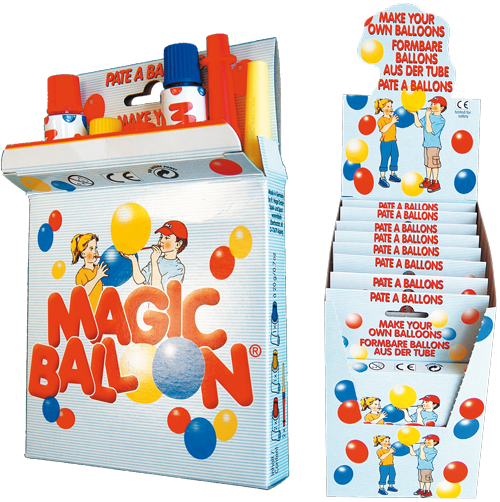 The combination of oral and breathing techniques used in MAGIC BALLOONS is a fun and effective way of increasing progress of speech disorder treatments. 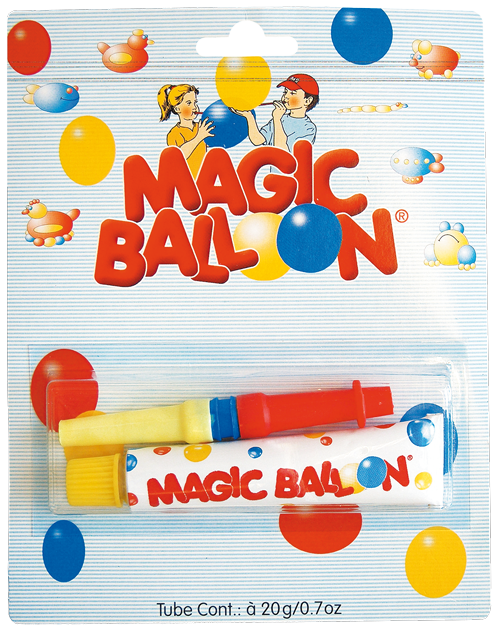 MAGIC BALLON is also used as a valuable tool in ergo-therapy and in neurological rehabilitation. The expansion of the balloon provides a positive visual feedback to guide the user’s action. In each display there are 24 folding boxes with 12 red tubes as well as 6 boxes with blue and yellow tubes. Each folding box contains one blow-pipe. Contains two red tubes and one yellow and blue tube each 4-piece box also has two blow-pipe. In each display box there are 8 4-piece boxes. Each blister contains five pouches as well as five blow-pipes. In each outer box there are 40 blisters. In each outer box there are 18 blisters with red tubes as well as 16 blisters with blue and yellow tubes. Each blister contains one blow-pipe. In each outer box there are 12 blisters with red and blue tubes as well as 12 blisters with red and yellow tubes. Each blister contains two blow-pipe.